Grace Gibson returned to America several times, but when she sailed to return to America in 1941, it was the day before Pearl Harbor and due to difficulty with shipping berths in time of War, Grace remained in America as Managing Director of TRANSCO. The Series with the distinction of being the first Australian series distributed in America by Grace Gibson was the ARTRANSA series she took back with her, Doctors Courageous, and she had it broadcasting on 250 stations throughout America. 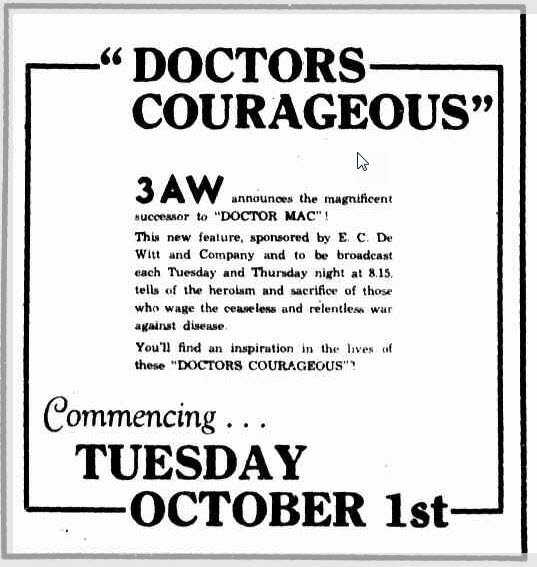 In Australia Doctors Courageous was broadcast in all states from various dates between 1940 and 1950. Each episode highlights an area where a Doctor has excelled. To quote the 'Barrier Miner' newspaper in Broken Hill "Doctors Courageous, one of the most stirring stories ever prepared for radio. Telling the story of men of medical science who sacrificed health, career and often life itself in their ceaseless battles against sickness and disease. Doctors Courageous is dedicated to those Men and Women." Scripts by Lynn Foster and cast for the series includes Harvey Adams and Arundel Nixon. We have episode one, the story of Joseph Lister. We thank Jerry Haendiges of otrsite.com for the recording, Craig Nugent for an example of the label used and Bruce Ferrier of Grace Gibson Productions for permission to play the episode here. If you are a fan of experiencing radio series/serials once again, take the opportunity to visit Grace Gibson Productions Shop where they are releasing their back catalog.